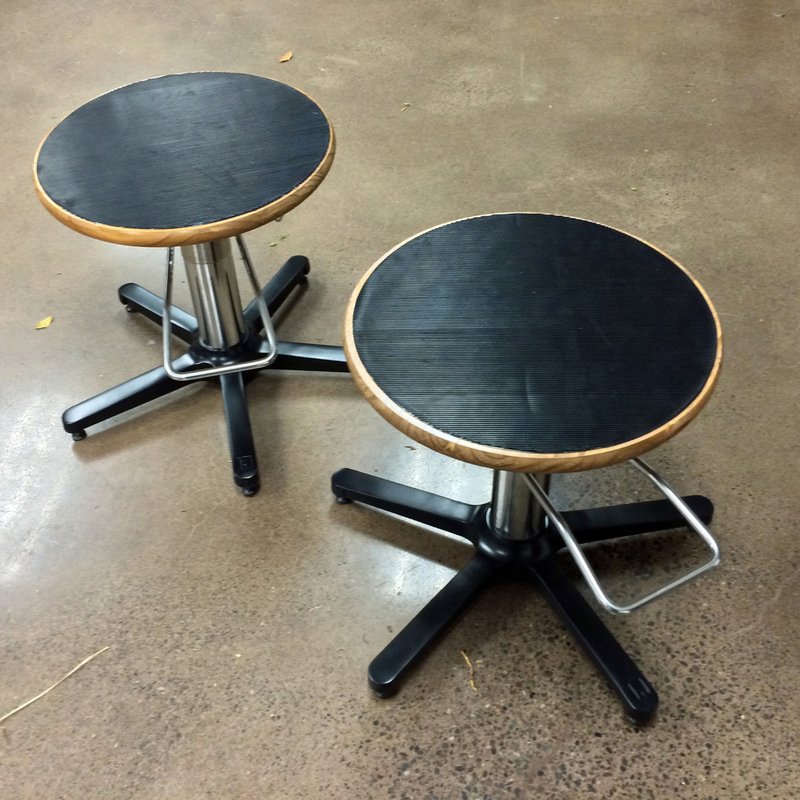 Just got back from picking up two new proper large bonsai turntables. Japanese hydraulic bases that adjust over a small range and lock in position. I probably need to write a full article about this tree and all my time with it has meant to me. I'm not ready for that today, but I do have a photo from the studio today and thought it would be interesting for people to see. 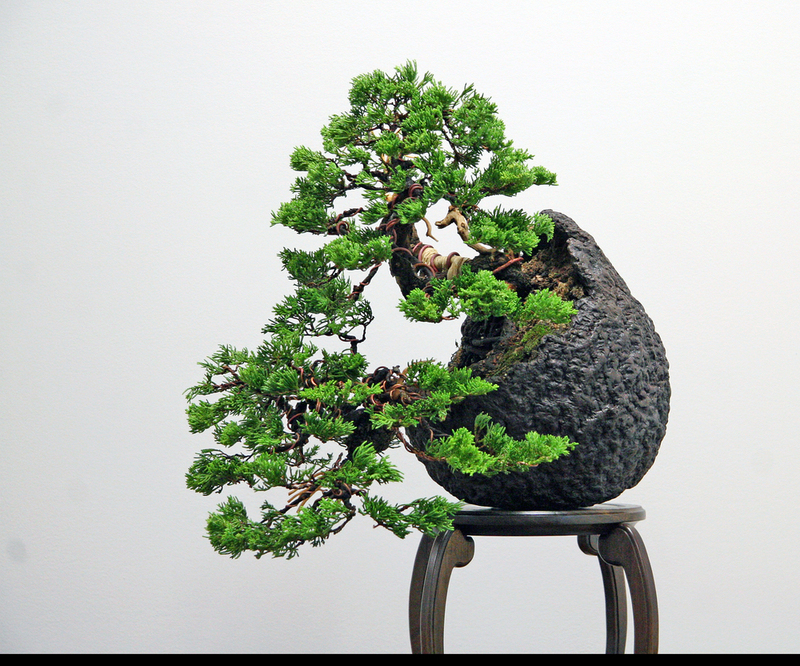 In spring 2004 I participated in the Joshua Roth New Talent Contest run by the American Bonsai Society. The material were young shimpaku junipers. Here are some photos of the progression of this modest little tree. The tree as I got it at the start. We randomly drew our trees at the start of the day. At the end of the eight-hour day. Didn't look like much. But the judges felt it demonstrated the best work on a bonsai that day. This photo is from April of 2007 after pruning and rewiring. Summer 2008. It's beginning to look like a tree. Fall of 2009. Ready for pruning and more shaping. The tree today, 8/30/13. Repotted at a new angle, thinned and unwired. Ready to rest for the winter. Stay tuned to see how this tree develops in the future. I spent quite a bit of time staring at this Juniper procumbens while I was at Bill Valavanis' colloquium in June. As I watered it every day over the last month, I could almost hear it saying "style me, style me." Not wanting to take any medication for the voices, I brought it into the studio and gave it a first transformation. There are more of these at the studio. One-on-one and group workshops are available; call us! After selecting a cascading orientation. Possible front 1. More dynamic left to right movement at the expense of less dynamic movement in the cascading trunk line. This might be lessened as sharis are added later in this tree's development. A more interesting choice of front. The only downside is less coherence in the movement of the main three trunk lines. This can be improved by slightly rearranging the lower trunks in relation to each other. All of the foliage needs tweaking to compact the tree with this front. For now, I've stressed this tree enough. Now is the tIme to let it recover. Such talented bonsai people in the U.S.
Last Spring I couldn't resist buying one of the great coastal redwoods the Shimons are collecting out West. Not having the right winter conditions for the species (yet), I had the brilliant idea to keep the tree in Michael Feduccia's garden in Florida. Michael is Ryan Neil's most accomplished student and a great guy to support. I styled the tree, paid for a year of care and Michael took it home for me. Last week he removed the wire and rewired the little monster for me. What a great job. Hope to find a pot for it before next spring. The ultimate goal is to show the tree at Epcot with the wonderful bonsai people of Florida. This concept of keeping trees in a professional's garden and having them prepare trees for exhibitions is a traditional one in Japan. It works well for both the professionals who need to earn a living, and the customer who gets a great looking exhibit. I look forward to participating in it as both a customer and a professional. Thanks for the great care Michael! PS: There's a link to Michael's nursery on my Friends of BSNY page. Coastal redwood after seasonal work by Michael Feduccia. 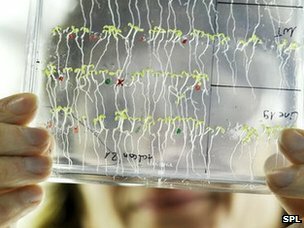 Fascinating story on how plants calculate their energy needs for survival when they can't make food at night. Just back from Rochester and Bill Valavanis' International Bonsai Colloquium. Bill was his usual energetic self as he kept the program running at the usual brisk pace. Lots of great information was shared; well worth the trip. It was great seeing Ryan Neil, Peter Warren, Kora Dalager, Dave DeGroot, and Kathy Shaner. It was also nice to meet Dennis Makishima. 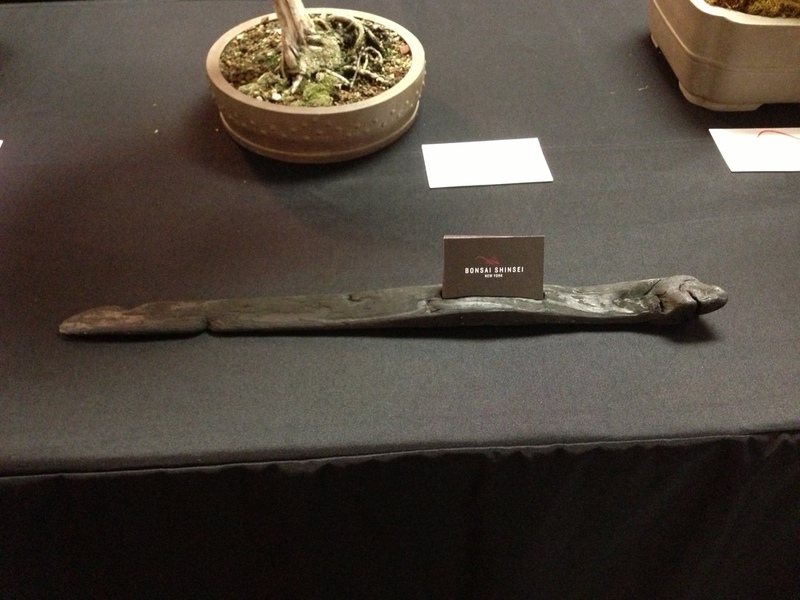 This was the first time Bonsai Shinsei New York was a vendor at a bonsai event. Not sure how often we'll sell at events like this, but it was fun to be one of the vendors instead of a perennial assistant to Sean Smith. A low-fi, low-light cameraphone shot of the booth. My business card holder. It looked a lot better after I purchased a beautiful wooden board from Dave Knittle it to sit on. Forgot to take another picture after adding it though. Although I spent much of the day delivering trees for this weekend's New Haven Bonsai Club exhibition, I did have time to prune and wire a cool collected Eastern White Cedar I got from a great New England collector a few years ago. These trees need lots of work to develop tighter foliage pads. One of my main objectives for my time at Bill Valavanis' colloquium next weekend is to get some tips from Mark Arpag. 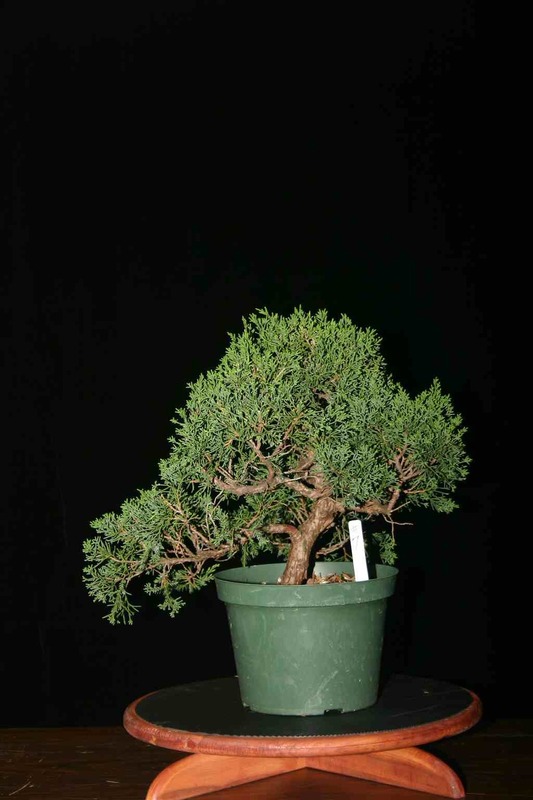 Take a look at his award-winning small cedar in the 2nd US National Bonsai exhibition book to see a beautifully developed Thuja. Here's the tree back in 2011 after a wiring. The droopy foliage is common for an unrefined Thuja. The tree today. Looks like I'll need to find a good pot for it before next spring. 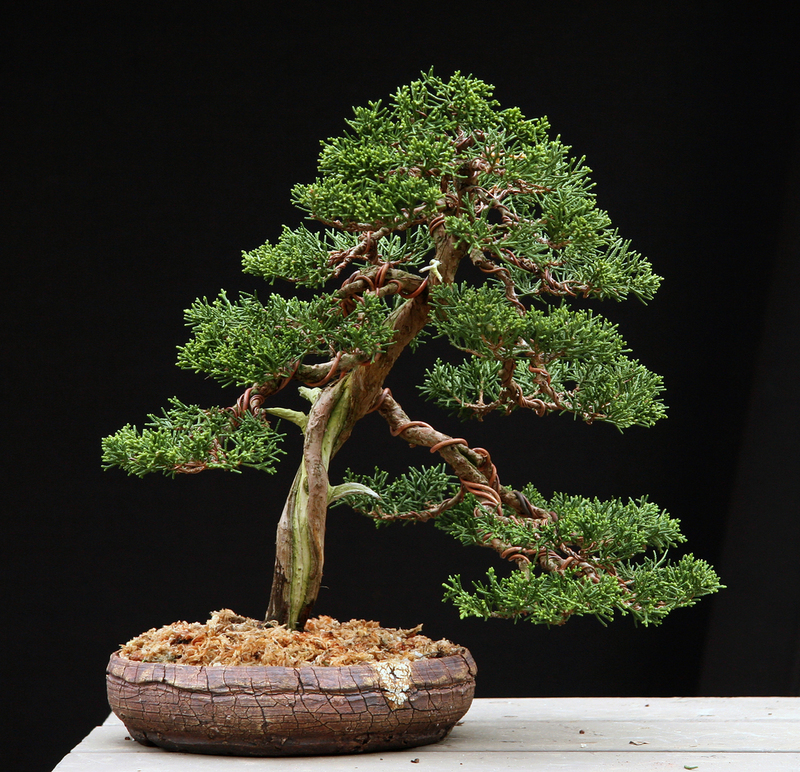 Here is a couple of quick looks at the birth of a new bonsai. 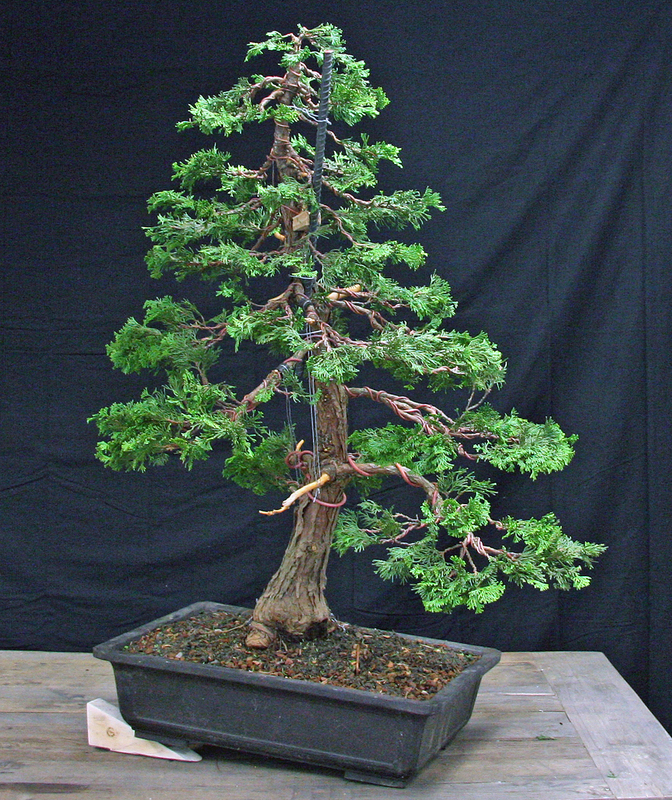 This Hinoki cypress (Chameacyparis obtusa) was dug this spring by Mark Comstock of Old Lyme, CT. He is identifying and acquiring wonderful pre-bonsai material that he'll be selling to the bonsai community for many years. This tree is the first of these that I've had a chance to work. I potted the tree for the first time in early April. It responded beautifully in aftercare which convinced me it would be ok to do a first styling this week. The tree after I got it home from Connecticut. In the studio happily in its mica training pot. I've attached a piece of rebar up in the top of the tree to let me pull the top of the trunk over to create an elegant s-curve. The guy wire at the top of the tree. The tree as it stands today. We've left more branches and foliage than the refined tree will have. Many of the lower branches will probably be removed and a more natural and irregular silhouette will be created from the new branching that hasn't yet grown. But we're happy with the start of this elegant new bonsai. Love my Pebble smart watch. I was a Kickstarter backer of the Pebble smart watch. A guy named Paul Rode wrote a watchface generator on the web to help non-programmers make watchfaces for the Pebble. I lost a couple of hours today, but I did get these cool new faces for my Pebble. Have a few more to mix it up over time. Sorry its not so sharp, but here's my big Rocky Mountain juniper. Another cool one using the clipped logo and BSNY's font. My korean hornbeam in Nick Lenz pot. A few weeks ago I posted some photos of some great multi-trunk juniper procumbens we obtained from down south. There wasn't a lot of interest at the time, so I decided to style one to show the potential inherent in the material. Since creating this tree, I've sold two of the four available. Email me if you're interested in grabbing one of the last two in the program. Just before potting in a great shell by Dale Cochoy. The finished tree. I left lots of extra foliage on the tree since I did so much work at once. I look forward to really cleaning this up in the fall or winter. The bottom looks very heavy in the photo. There are actually two whole branches; one on each side. I may eleiminate once once I see how the tree reacts to the work. In the meantime, it goes in aftercare for a few weeks, then out in full sun in the garden. This is such great material; I look forward to working with students on these trees. New bonsai imports to Europe? Bonsai are held in quarantine prior to export to Europe in Seiko-en nursery of Omiya Bonsai Village. 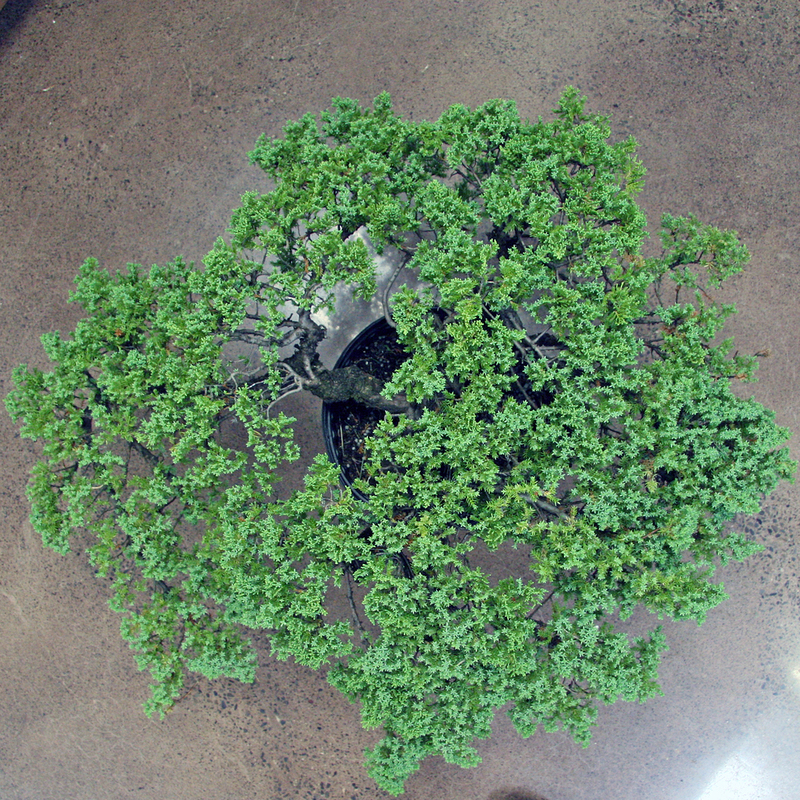 Aftercare is one of the most important techniques in bonsai. Once you realize the MOST important technique in bonsai is keeping the trees alive, the importance of aftercare becomes obvious. Repotting and styling are two of the most stressful kinds of bonsai work. Giving the tree the most favorable conditions from which to recover just makes sense. When I repot or heavily style a tree, it goes into my poly house which is protected from wind and sun; all extremes that might add stress to an already stressed organism. I leave them in these surrounding for 10 to 14 days (sometimes also misting or adding bottom heat depending on species and circumstances). After returning them to their normal growing location, I monitor them for signs of stress. If I see any, then its back to the poly house for another 10 to 14 days. Aftercare; your trees will thank you. Large Rocky Mountain Juniper pushing new growth just a week after its first repotting from post-collection. a closer shot of the large Rocky Mountain Juniper pushing new growth just a week after its first repotting from post-collection. This is a large field-grown Hinoki cypress after having been heavily pruned and potted for the first time. Aftercare is clearly working for this tree. Yamadori American (Canadian actually) larch. FIrst time in a ceramic pot. Will be figuring out how to rearrange the gins later in the year. Steam? Fire? Five great procumbens junipers arrived at the studio a few minutes ago. They are tremendous multi-trunk specimens perfect for learning about juniper design and creating a bonsai with a future. These are for one-on-one workshops; if you've got a friend or two with whom you'd like to work on these as a group, contact us and we'll try to accommodate you. Ryan Neil of Bonsai Mirai sent this pic of my sweet shohin cascade Fir after its spring flush of growth. 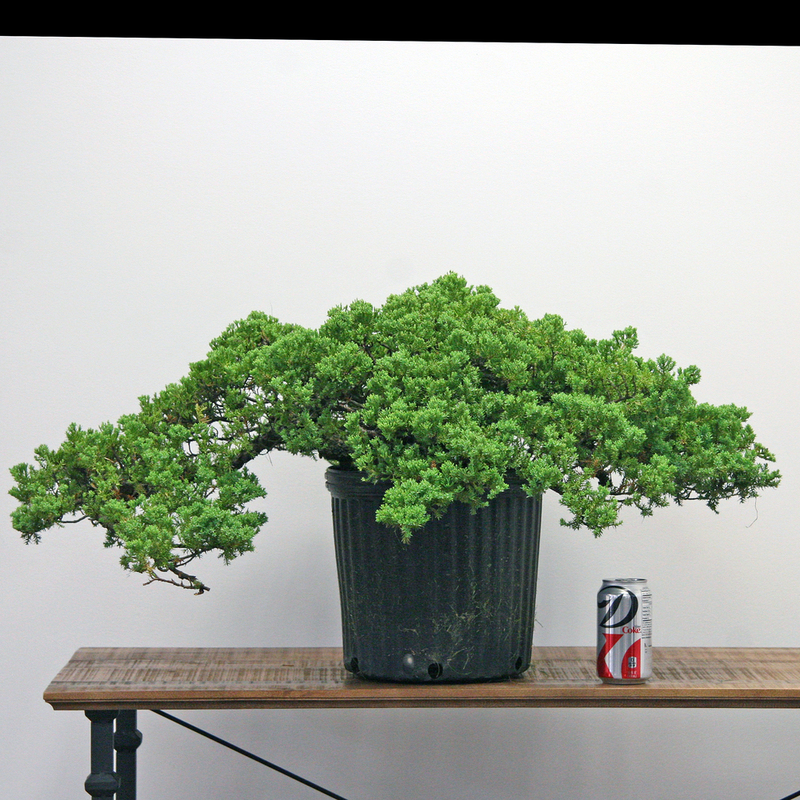 I feel fortunate that Ryan sold me this tree and I could style it out there last summer. On another positive note, the truck left this morning bringing me some great trees for BSNY. Visit the site often to see the latest updates. Here are a couple of quick iPhone shots of trees repotted this week. Ryan Neil of Bonsai Mirai came to the studio to help improve my skills and some of the trees at Bonsai Shinsei New York. Ryan has forgotten more than I know about bonsai, so I value any chance to learn from him. A big Rocky Mountain Juniper I acquired from Bonsai Mirai in 2011. 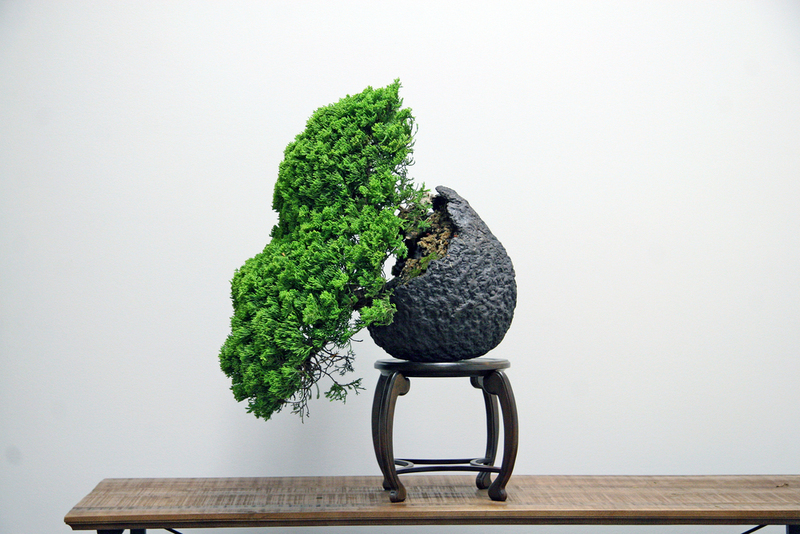 This is its first bonsai pot; a beautiful, slightly large Sara Rayner semi-cascade. My Scots Pine 'Beuvronensis' that has been in development since 2004. Hope to remove all of the hardware next spring. I received an interesting gift the other day. It's a small wooden box used by Yuji Yoshimura in the fifties and sixties. I'd love any help translating the kanji. 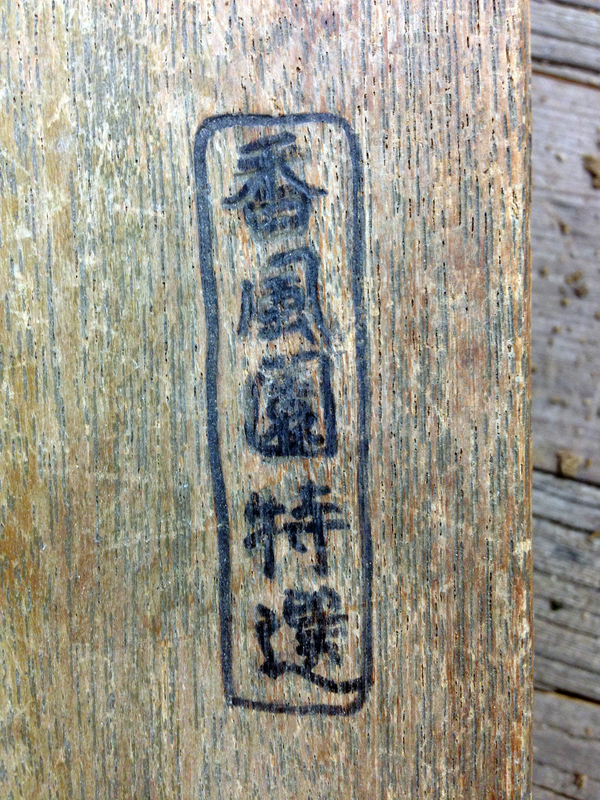 The first characters in the large inscription say "bonsai." Beyond that I'm lost. If you can read any of it, please leave the translation in the comments. UPDATE: Bill Valavanis wrote on Facebook "Those boxes were used for Yoshimura's students in the classroom. He had the boxes made from Zelkova wood for his nursery. The upper right kanji in the box have the name of his nursery "Kofu En". Notice the date he had them made on the inside. 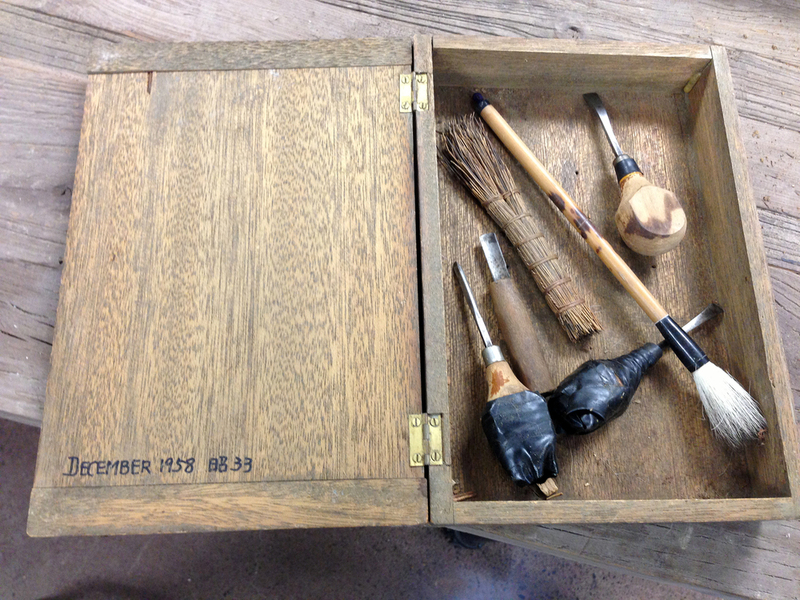 Originally he had all the tools specially made in Japan for each box and Yoshimura Bonsai Company stamped on each one. I'm luck to have 15 of those boxes which now my students use, but of course they are now all filled with new tools." The Japanese date is Showa 33. Just a couple of quick pics before watching today's Formula One race. My japanese larch group always opens before my American larches. Here's what it looked like a few minutes ago. My American (Canadian) larch in its new pot. Can't wait to clean up the pot and take a photo with my real camera. After wiring a couple of weeks ago. 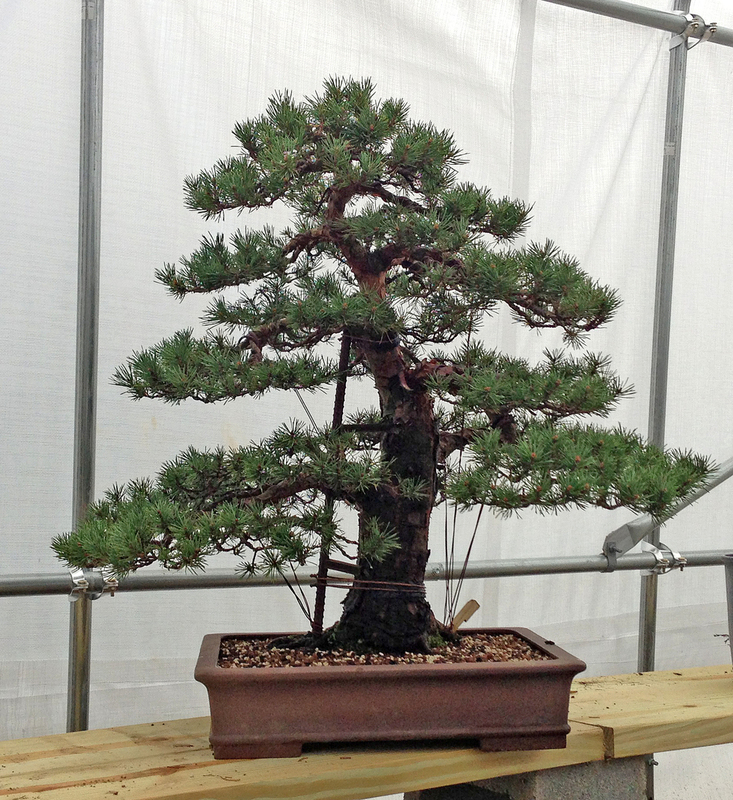 The National Bonsai and Penjing Museum in Washington, D.C. now has an app! Wherever you are you can explore the museum and browse the collection on your iPhone or iPad. Grab it for free on the App Store or check it out on iTunes on the web.